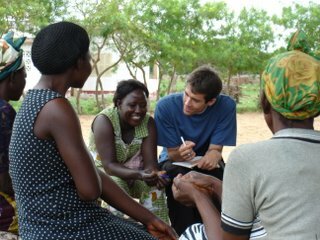 Ashoka: Social entrepreneurs are individuals with innovative solutions to society’s most pressing social problems. Skoll Foundation: The social entrepreneur aims for value in the form of transformational change that will benefit disadvantaged communities and ultimately society at large. Wikipedia: A social entrepreneur is someone who recognizes a social problem and uses entrepreneurial principles to organize, create, and manage a venture to make social change. Personally I think these are all just exercises in the use of big and fancy words. I see the social entrepreneur in a more simplistic light. I see it as anyone struggling with the conflict between making a social difference (connotation ethical) and making money from it (connotation unethical). If the money thing isn't a factor then you're essentially just social, and if the social aspect doesn't drive you then you're probably just an entrepeneur. It's a weird dichotomy that I have to admit to facing myself. I'm not really interested in anything unless it has a positive human impact and the whole business of making and managing money gives me the willies, but at the same time I really don't think I could go back to being paid an average wage again. I wonder if I'll ever resolve this properly or if I'm destined to keep walking this slightly uncomfortable tightrope? Are you a social entrepreneur? Tell us what you think! My typology is really geared around motivation and business maturity. You touch on motivation here (socially oriented or materially oriented)? However, I encourage all entrepreneurs to "make meaning" (using Guy Kawasaki's mantra for entrepreneurs). You should be able to make meaning in your business regardless of whether your primary motivation is a material one or a social one. I also believe that you can focus on providing value to a group and the money will follow if you do that well. Don't agree with your dismissal of these definitions as exercises of big and fancy words Riz ;) I think they're well rounded and do the job quite well (Wikipedia's is particularly clear and to the point). The dichotomy you've described is more of a description of one of the challenges/dilmmas that (some) social entrepreneurs face, than an actual definition of what actually makes them. No? I don't think it's actually that black and white (you're either driven by money or social change). Julie Brown of Growing Communities in her Smarta interview last Thursday at the Women Social Leadership awards explained that she actually really enjoyed the 'making and managing money' aspect of her Social enterprise (although she's not making any for herself of course!). Making money and driving social change aren't necessarily mutually exclusive and sometimes one is used to drive the other and vice versa. Money in this case is a tool to develop and expand your Social Enterprise and so being driven by it isn't seen as an issue. It's simply an enabler (and a motivator) to helping you achieve a 'higher' purpose. Great to hear different opinion, because on a personal level I think I'm still trying to understand exactly what a social entrepreneur is. What I was getting at is that social enterprise is about not about one or the other, but both money and social impact together, which are usually topics that we're socially enculturated into thinking of as mutually exclusive. Hence the dichotomy, and the subsequent internal conflict. The other definitions glamorise social enterprise a bit I think, and still feel that they are partly exercises in the use of big words. 'innovative solutions', 'transformational change', 'entrepreneurial principles' all sound a bit like jargon to me. On the other hand, the idea of making meaning is very interesting and I can see that i could just be thinking too literally around the definition of enterprise. Maybe being enterprising in this context is really more about how you approach the creation and management of solutions to social problems. Thanks and keep your thoughts coming! I also think the dichotomy between social and money is not so black and white. I would add Bill Gates on "creative capitalism" and Muhammad Yunus on Social Businesses to the discussion. I've been interning at Ashoka and getting to listen to their social entrepreneurs who come through the office I would say none of them are motivated by money. All are driven by social goals, their business savvy, use of income generation and entrepreneurial spirit are all simply tools to reach their social mission. I have likewise experienced that internal pull between pursuing social goals or my own financial security considering the ocean of wealth around me in the United States. I would propose that a true socially driven entrepreneur would rid themselves from the allure of personal wealth; I believe it is primarily an issue of the heart and motivation.